St George’s was designed in the Neo-Classical style then current in London. The Government architect, John Lee Archer, designed the body of the building; the tower and porch were designed by convict architect, James Blackburn. The church has an unusual layout, with two side aisles instead of a single central aisle. It still has its original cedar box pews. Having completed the initial work, it was decided in 1841 to proceed with the tower. The Government was asked for assistance, and agreed to grant convict labour, stone and timber, on the basis that the subscribers were to supply cartage, lime, lead and other materials. Work began on building the tower, but it was soon found that the tower basement, which had been put in at the time of the original building, was badly built and insufficient to bear the weight of the tower. It was found necessary to remove this basement, as well as the vestibule and the two vestries on either side of it. For various reasons, one of which was the inability to supply suitably skilled convict labour, the work was frequently interrupted and left for long periods. By 1847 the tower was finally completed, but the porch and the rooms at the basement of the tower were left unfinished. For five years “the Church was more or less exposed to the weather and great inconveniences were occasioned to the congregation” Erected to serve as a mark for shipping, the tower of St George’s has been a landmark for sailors ever since 1847. Back in the nineteenth century when St George’s was built, Battery Point was home to master mariners, shipwrights, seamen, fishermen, shipping agents and many others who worked in the shipbuilders’ yards and on the wharves. These connections earned St George’s the name of “The Mariners’ Church”. In 1851 a poor school was built behind the church so all children in the parish could gain an education. Today these rooms are used by many community groups. In October 1862 Mr Hore had a tender of £462 accepted for finishing “two wings of the Church”. These are quite substantial side buildings in a style similar to that of the Church. Though the Tower was built very soon after the main auditorium, St George’s porch was not added until 1888. The stone for its fine fluted Grecian columns was quarried at Bellerive. In 1873 land adjacent to the church was bought for a parsonage at a cost of £163, the money being raised from rent of the School Room, subscriptions and surplus of Parish Funds. It was not until May 1895 that a decision was taken to build the Parsonage, to contain 3 living rooms, a study, 4 bedrooms, a kitchen, servant’s room and usual offices. A tender of £735 was accepted. The foundation stone was laid in 1896 by Henry Montgomery Bishop of Tasmania and father of Field Marshal Bernard Montgomery of Alamein. The building was finished in September 1896. One of the reasons for the long delay was that the Rector, Canon Banks Smith, lived in his own house opposite the church (now 27 Cromwell Street). As he did not wish to move into the newly completed Rectory, the house was let. In January 1906 it was decided to build a new Sunday School on land recently bought adjoining the old Sunday School. This very substantial building was erected in 1914. In November 1918 the church records note that the new Sunday School was not sufficient to contain all the scholars and the old Sunday School was having to be used. 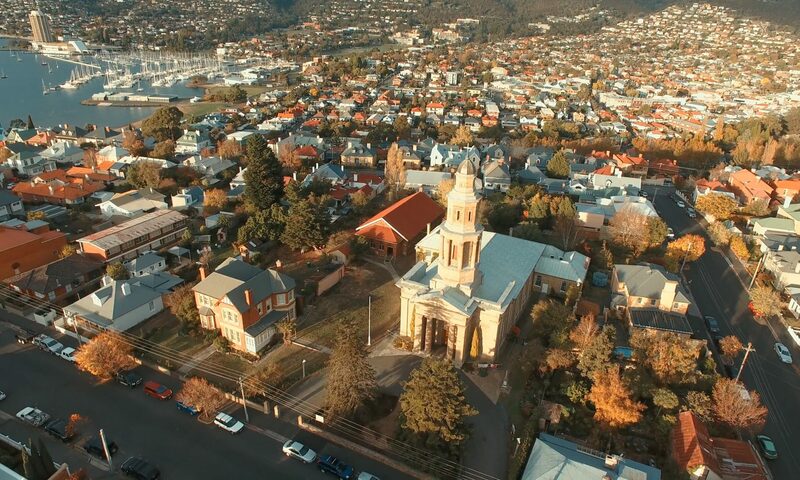 In 2013, St George’s Church marked its 175th anniversary, celebrating a milestone that is both significant to the church and Tasmania’s heritage. Built in the Greek-Revival style of a bygone era, St George’s Church is recognised nationally as a heritage building rich with architectural, historical and spiritual significance. St George’s Church continues to be an important landmark, serving the community through services for worship and fellowship, advocacy work, a venue for many community groups and numerous events and concerts, as well as a centre for visitors and tourists to enjoy Tasmania’s rich heritage. It is home to a living, worshipping congregation who are always ready to welcome newcomers.